indeed; for those who may not be familiar, see 'behavioral economics'  for the ways that known quirks in human reasoning can be used to game consumers. don't buy a house without learning about it. there are two great books I recommend for those interested: predictably irrational  and the upside of irrationality . personally, I think the first is better than the second as a layman's introduction to it. 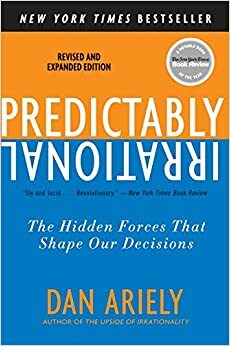 Dan Arielly's "Predictably Irrational" (http://www.amazon.com/Predictably-Irrational-Revised-Expande...) is a great book that covers such phenomenon. On a related note, for anyone interested in this, I recommend reading "Predictably Irrational" by Dan Ariely. He does actual studies and discusses a lot of these things (bias to loss aversion, change in behaviour when 1-layer detached from cash) and more. > Come da titolo, se siete esperti di economia ditemi un po' dove posso trovare una trattazione divulgativa della materia o un qualche corso online. Dunque: IEA e' abbastanza tecnico e te lo sconsiglio, ma Undercover Economist e' divertente, e puo' valer la pena di leggerlo anche solo per intrattenimento; sulla stessa riga c'e' anche Freakonomics che pero' a me e' piaciuto molto meno. Se poi ti viene la voglia, io inizierei con un po' di microeconomia, ci sono ottimi testi universitari che pero' costano un botto; pero' in genere si trovano usati a poco. Quello di Krugmann e' molto 'easy/pop' e con poca matematica (l'ho solo sbirciato, pero'); io ne avevo uno di Perloff e non mi sembrava male (ma parlo di un bel po' di anni fa; probabilmente c'e' qualcosa di piu' aggiornato). Per i corsi online: una mia conoscenza ha seguito un corso su Coursera di un tipo indiano (non mi ricordo), ma era orripilante: un mio amico lo seguiva, mi ha chiesto di dargli una mano, ho provato a guardare uno dei video e non ho mai visto spiegazioni cosi' vaghe e confuse. Evitalo come la peste..
Credo che qualcosa di migliore sia su Khan Academy; vale la pena di guardare. (EDIT: ho guardato ed e' un po' stringato, ti servira' un supplemento. Krugmann, Perloff o qualunque altra cosa sia disponibile usata a prezzo ragionevole; evita le traduzioni italiane, pero'). Dopo aver guardato un po' di microeconomia, potrai decidere su cosa buttarti. Se ti interessa la finanza e ti piacciono i romanzi, leggi Liar's poker , che mi e' sembrato spettacolare. E se a questo punto ti prende l'idea di capire cosa sono mai questi misteriosi bond e derivati, c'e' un ottimo e chiarissimo (ma un po' pesante) libro di finanza di Ivo Welch disponibile online; richiede un po' di matematica ma e' chiarissimo. Ah, visto che ora va di moda la 'behavioral economy', puoi anche leggere qualunque cosa di Dan Ariely (tipo Predictably Irrational ), ed e' sempre divertentissimo (e ha fatto pure lui un corso su Coursera con cui mi sono diverito un sacco). Ma se ti interessano poi gli aspetti seri, leggi lo spettacolare Thinking fast and slow di Kahneman (premio nobel, a ragione). I think this depends on what you're going for, but I've really enjoyed Applied Predictive Modelling by Max Khun and Kjell Johnson. It's a great practical introduction to the technical aspects of the field without a prohibitive amount of mathematics. Each section has a computation chapter which goes over implementations in R.
If you want to get to know the math better, Pattern Recognition and Machine Learning by Christopher M. Bishop is a good resource (I'd recommend it alongside or after a more applied book). This book is not an applied book but will be good if you want to understand the why and how of common algorithms. Black Swan and Predictably Irrational are good readings that provide insights about the behaviour of the world and where data comes from. Elements of Statistical Learning and Introduction to Statistical Learning are both commonly recommended resources, however I haven't worked through them and can't provide a review. It's worth considering that not everyone views these kinds of regulations through a purely consequentialist lens. Philosopher Michael Sandel discusses this in his book The Moral Limits of Markets . One concern is inequality, as you say. The other is that when you "commodify" something, it changes our relationship to it on a fundamental level. The classical economic/utilitarian perspective is that donating an organ and selling an organ are basically the same transaction, except that in the former case the price is zero. By mandating a price of zero, we get a shortage of donated organs, therefore we should allow the price to be set by market forces. But to some people, like Sandel (who probably falls philosophically more along the lines of virtue ethics, this feels intuitively wrong. They would argue that donating and selling are not the same action from a moral perspective. They would prefer 10 organs being donated to 10 being sold; they might prefer 5 being donated to 10 being sold. Based on my very limited knowledge of behavioral economics it seems that there is some support for this moral intuition. Dan Ariely argues that people act differently under "market norms" than they do under "social norms." If you stop someone and ask them to help you move a sofa for $1, odds are they'll be offended, whereas if you offer them nothing, they might oblige you. In the first case you're appealing to market norms; in the second, to social norms. Another example is the well known daycare study, where imposing a fine for late parents caused more lateness. Setting a price for lateness sent a signal that the daycare was operating under market norms, rather than social norms. This suggests that there can be both market and non-market approaches to problems. The market solution is to adjust the price. The non-market solution is to adjust norms, such as by changing organ donation from opt-in to opt-out. > An alternative approach, used in several European countries, is an “opt out” rule, often called “presumed consent,” in which citizens are presumed to be consenting donors unless they act to register their unwillingness. > In the world of traditional economics, it shouldn’t matter whether you use an opt-in or opt-out system. So long as the costs of registering as a donor or a nondonor are low, the results should be similar. But many findings of behavioral economics show that tiny disparities in such rules can make a big difference. > By comparing the consent rates in European countries, the psychologists Eric Johnson and Dan Goldstein have shown that the choice of opting in or opting out is a major factor. > Consider the difference in consent rates between two similar countries, Austria and Germany. In Germany, which uses an opt-in system, only 12 percent give their consent; in Austria, which uses opt-out, nearly everyone (99 percent) does.